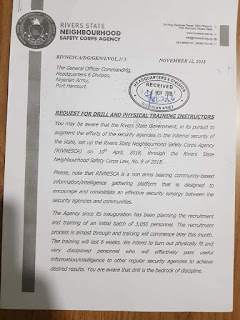 Rivers State Governor, Nyesom Ezenwo Wike has declared that the Nigerian Army has been transformed into a political weapon that has abandoned her security responsibilities. He stated that the disruption of the training of the Rivers State Neighbourhood Safety Corps Agency Training programme by the Nigerian Army is the worst act of irresponsibility, aimed at instigating insecurity In the State. “The Army is not concerned about the killing of soldiers in Borno. 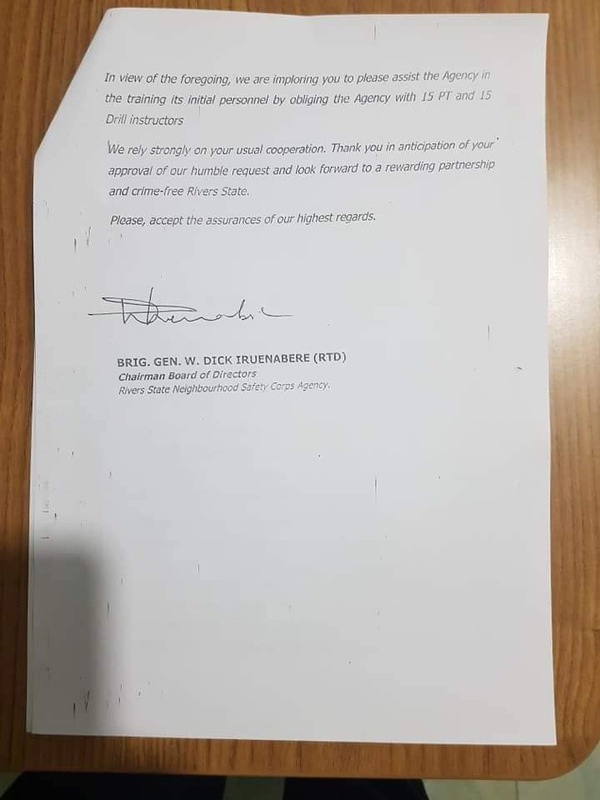 They are only interested in creating insecurity in Rivers State. “If you don’t want Rivers State to be safe, then Nigeria will not be safe. They want to use their guns against us”, he said. The governor said that Zamfara and Kogi States have vigilante outfits which were commissioned by the Nigerian Army and the APC Federal Government. He wondered why the Nigerian Army would stoop so low to disrupt a legal training exercise. “Zamfara and Kogi States have vigilante groups. They commissioned them and the Chief of Army Staff did nothing. The House of Assembly passed a law approving the Rivers State Neighbourhood Safety Corps Agency. The Chief of Army did not challenge the law in court, but today he sent troops to invade the training camp”, he said. The governor regretted that the Nigerian Army has been turned into an outfit to stoke insecurity in order to attract huge security votes. He said: “The Army is the agency causing insecurity mainly to attract more security votes. They collected $1Billion from our excess crude account, yet our soldiers were killed. “All they are doing is to intimidate people for political reasons. When you fight a state blessed by God, you will crumble. Nobody can intimidate us in Rivers State “. Governor Wike said that the State Government worked with the Police, the DSS and other Federal Agencies to ensure that only law-abiding citizens are recruited by the Rivers State Neighbourhood Safety Corps Agency. “We did not hire boys for political reasons. This has been a transparent process and that is why the personnel are trained at the NYSC Orientation Camp at Nonwa. “We involved the Police and the DSS to ensure that the trainees are profiled for the good of the society. The main aim of this agency assist the security agencies with intelligence and information, since there is a lacuna in this regard “, he said. Governor Wike declared that the State Government will continue with the training. He said all the antics of the Nigerian Army will not deter the government and people of Rivers State. “No one man has been a Chief of Army Staff forever. Every job has an expiry date. When Buratai leaves office, he will be held to account for his illegal actions. 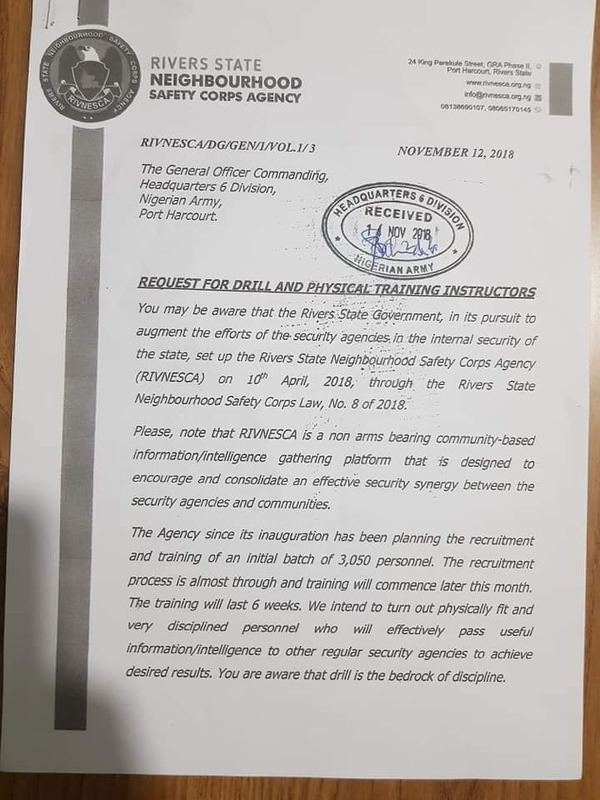 “If they stop the training elsewhere, personnel of the Rivers State Neighbourhood Safety Corps Agency will be trained at the Government House Port Harcourt “, the governor said. 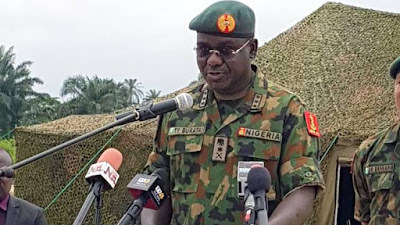 Troops of 6 Division Nigerian Army (NA) today the 29th November 2018 while on a routine surveillance at Nonwa Gbam, (NYSC Orientation Camp) in Tai Local Government Area (LGA) of Rivers State, discovered an illegal militia training camp. The troops met over 100 recruits undergoing military type of training.